NYC, 02/08/2019, 1:00PM. 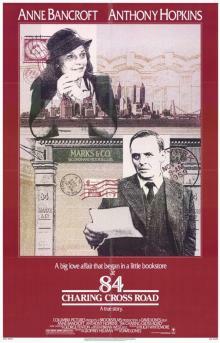 84 Charing Cross Road (1987): British-American biographical drama. 100 min. Director: David Hugh Jones. Starring Anne Bancroft, Anthony Hopkins, Judi Dench. The screenplay by Hugh Whitemore is based on a play by James Roose-Evans, which itself was an adaptation of the 1970 epistolary memoir of the same name by Helene Hanff, a compilation of letters between herself and Frank Doel dating from 1949 to 1968. The play has only two characters, but the dramatis personae for the film were expanded to include Hanff's Manhattan friends, the bookshop staff and Doel's wife Nora. The film was shot on location in London and New York City. London settings include Buckingham Palace, Soho Square, Trafalgar Square, St James's, Westminster, White Hart Lane in Tottenham and suburban Richmond. Manhattan settings include Central Park, Madison Avenue, and Saint Thomas Church.